Bulky yarns are truly in this season. Every catalouge or store I've seen and been to has a vast array of bulky scarves and cowls. Bulky yarns scream cozy, warmth and for a knitter – instant gratification. The temperature in the northeast has gone from 75 to 55 in the last two days. It seems as if we are skipping Fall completely. I find it a little funny that I'm such a cowl maker this season. In the past, the ones I've tried just didn't seem to lay right or they weren't snug enough to keep my neck warm. 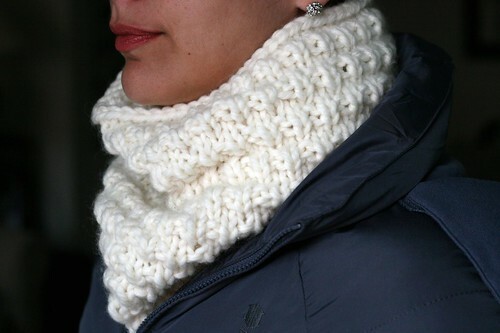 I purposefully made this cowl oversized so it can be scrunched down much like the Luxe Cowl. I think that's the biggest difference between my older "fail" cowls and my new cowls – the scrunch factor. I call this my Snow Cowl. Work until cowl measures 17inches or until desired length ending with a knit round. Love it! Will make it, posthaste! What a quick, snuggly knit! And I love “the scrunch factor”. That’s why my one and only cowl isn’t too comfy..not enough scrunch! I made your Luxe Cowl with some Rowan that has been sitting around for 5 years in the stash. I’ll post a pic on Ravelry soon. Now with this cowl, I know what to do with the other 2 balls! I’ve just finished 5th Avenue scarf and now I know what to knit next! I have some bulky yarn I’ve been wondering what to do with. Thanks for the pattern! I wasn’t sure if big cowls and infinity scarves would be around in NYC this year; however, I’ve been seeing them everywhere 🙂 thank goodness – I love them! This pattern is adorable….Can you use another bulky yarn for this pattern? If so, could you please give me some suggestions. I live in Ontario, Canada and am unable to find Rowan Big Wool. Thank you so much. Thank you so much for sharing this pattern! I made both this cowl and the luxe cowl over the past few days – a great way to use up some of my stash for last minute holiday gifts. I’ll post to Ravelry soon! yanked out some Lion Brand Wool Ease thick & quick and it is fairly flying off the needles…can’t wait to finish it…..thanks!!! I guess that to receive the loans from creditors you should present a good reason. But, once I’ve got a credit loan, because I wanted to buy a building. I have someone who is going to make this for me but I am purchasing the wool. Is it 2x 50g balls or 2x100g balls? Discipline overall has improved since last year, but now that my teaching is mostly under control. 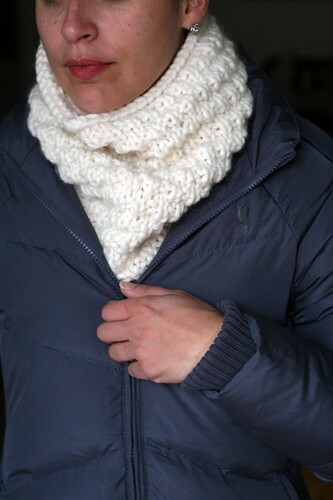 What a lovely and easy to make cowl. I just pinned this! Thanks! These are simply lovely – I’ll need to get my husband to work on one for me! Nous sommes un groupe de bénévoles et de commencer un nouveau régime dans notre voisinage. Votre site nous a fourni de précieuses informations pour travailler sur |. Vous avez fait un travail impressionnant!